Dandelion greens are great. Loaded with minerals and good for you liver. The best way I like to cook them is to blanch them for a few minutes in boiling water and then saute quickly in oil and then sprinkle with lemon juice. 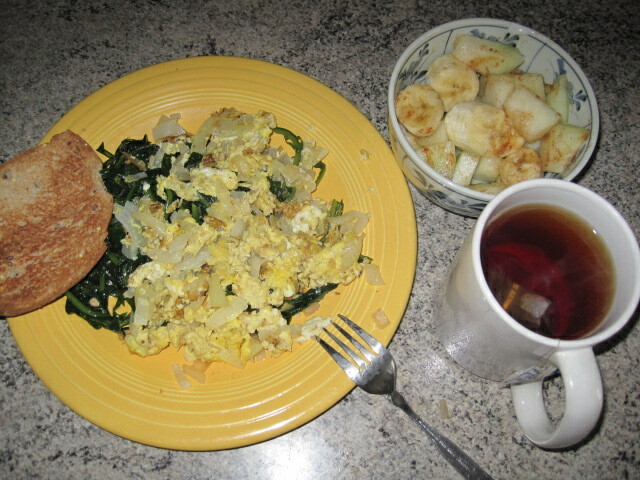 Dandelion w/ greens, eggs, onions and toast. Melon and banana with cinnamon. English breakfast tea. One issue on this budget program is eating on the go. 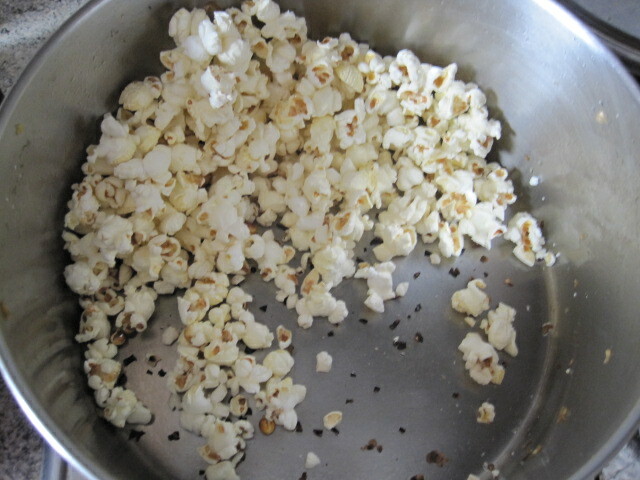 I don’t particularly endorse eating popcorn as a meal but for a low-budget healthy snack-it’s pretty good. 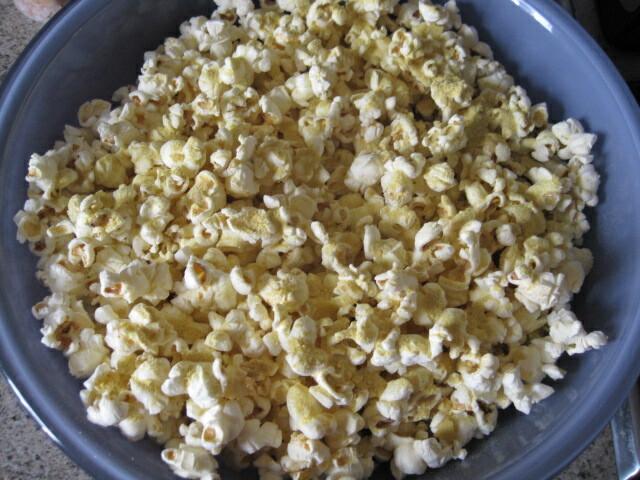 This total amount of popcorn plus nutritional yeast cost: .34¢ ! 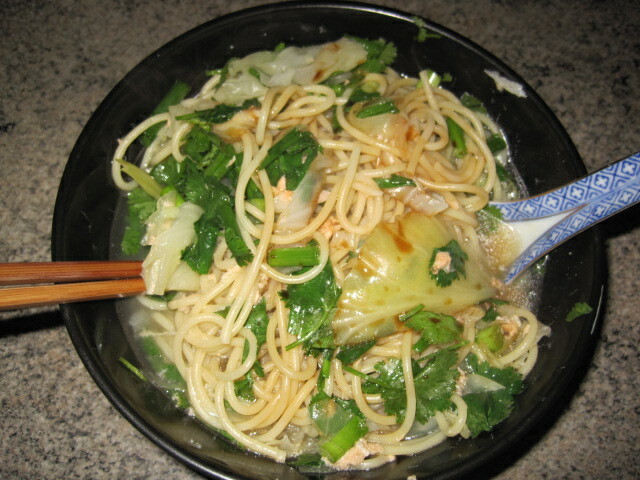 This is what I made with the bag of Salmon parts from Duc Loi. I boiled the salmon parts for about 40 minutes with a small piece of kombu seaweed and ginger. I have to admit that I don’t know the cost of the seaweed but a small little piece like that not too much. I used cabbage because I had purchased some with the intention of making some kim chi but bok choy or other greens could be even better. Green onions and cilantro (.33¢ a bunch for at Food Co.) gave it a lovely flavor. Soy sauce sprinkled on top. It’s a little oily but it’s tasty I’m getting my Omega-3’s kind of way. Not the best for small children, watch out for bones! I don’t want to rely on white pasta (even though it’s enriched) for filling me up on this challenge but it’s cheap and it does. Grain with its germ still intact or included in the case of whole wheat pasta make more sense from a health point of view. Thanks, I’ll check out your blog too. I’m at least trying to show that you can!